Using lighter colors, bringing in more sunshine and a few other tricks can help you visually enlarge your kitchen. 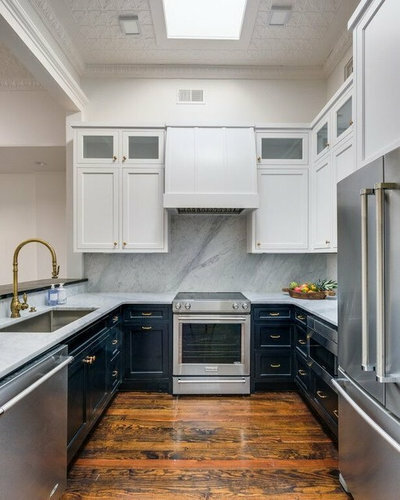 If you’re remodeling a kitchen and looking to create more space without having to add on or move walls, your design choices may make a big impact. First, start by selecting lighter colors, such as grays and whites. Then consider implementing a few designer tricks to visually enlarge your kitchen for a light and open feel. These three kitchens show you how. 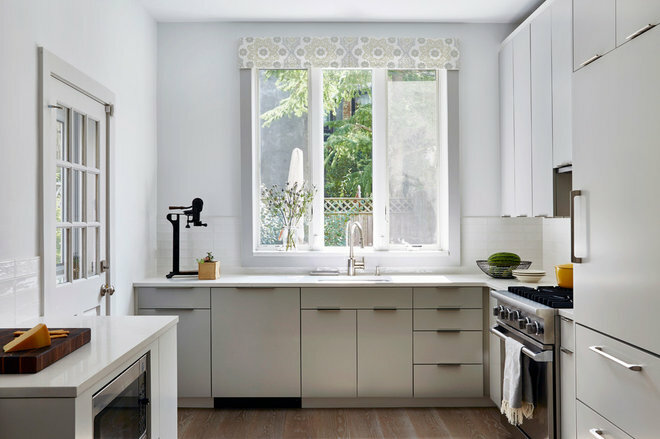 Size: 158 square feet (14.6 square meters)Homeowners’ request: Remove dingy cabinets and dark green granite countertops, and create a bright white, crisp and clean look in a tightly packed Brooklyn brownstone. Space-saving style: Natural light, an open layout and a light-reflecting cabinet color, which “keeps the focus on what matters — the view out — and lends a spacious feel,” designer Jennifer Morris says. Other special features: Custom lightly cerused oak cabinets painted a soft gray-white. “The hint of gray color prevents the space from feeling stark or severe, lending a touch of warmth,” Morris says. 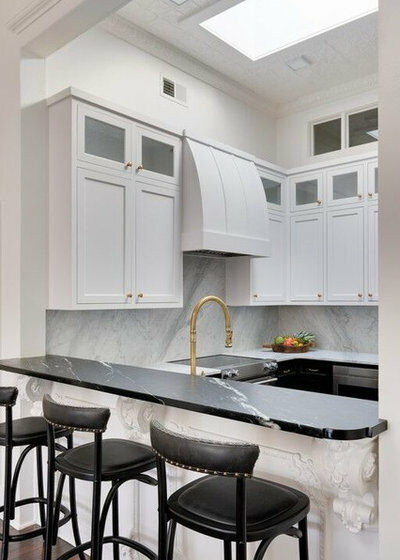 Calacatta Gold-style quartz countertops. Wide-plank flooring. Handmade porcelain backsplash tiles. Hand-printed fabric on window cornice. 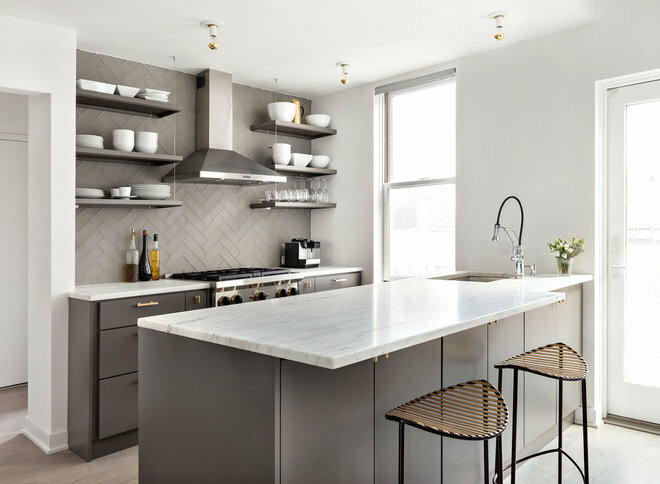 Size: 120 square feet (11.1 square meters); 10 by 12 feet (3 by 3.6 meters)Homeowners’ request: Remove three columns, replace laminate countertops and old cabinets, add new appliances and create a “modern Parisian loft” theme. Other special features: New cabinets with soft-close drawers and pullout corner storage. An undercounter microwave keeps the counters free of clutter. Brass finishes. Homeowner’s request: Bring better flow to a poorly laid-out space and create a larger island with seating. Space-saving style: Custom cabinets with smart, efficient storage allowed the homeowner to skip upper cabinets and go with open shelves for a lighter feel. Moving the refrigerator to the other side of the room helped open the workspace. Other special features: Glass tile backsplash in herringbone pattern. Olympian marble countertops. Brass pulls and shelf rods. “Uh-oh” moment: “One of the more challenging issues we encountered in this space was how to have a full 10-inch overhang for seating at the island without inhibiting the swing of the patio door,” general contractor Jonathan Eklund says.